Gov. Snyder is right that oral health is an important part of a person’s health, a fact that is not well enough known and too often forgotten. Michigan has too few health professionals, in some areas of the state, particularly dental providers. And evidence suggests that Michiganders may be paying more than they would had if more people had access to preventive dental services. Neglecting preventive care means that too often people wait until a minor dental issue escalates into a major one, perhaps even requiring a trip to the emergency room. For example, a 2014 study by Anderson Economic Group found that there were more than 7,000 emergency room visits in 2011 in Michigan for preventable dental issues. Over 1,000 of these visits turned into hospitalizations, but about half of them were for treatment of cavities — a problem that can be easily dealt with in a dental office. Using emergency rooms for preventive and relatively routine dental services is inappropriate, in Gov. Snyder’s terms, in part because it requires time and resources of medical staff who could otherwise serve patients with more urgent and dire medical emergencies. It’s also extraordinarily expensive. Estimates suggest that it costs about five times more to treat pain and infections resulting from dental problems at a hospital’s ER department than the appropriate care would have cost at a dentist’s office. The AEG study estimated that patients and insurers paid about $15 million for the dental-related 7,000 emergency room visits in 2011 — or, more than $2,000 per visit, far more than preventive care at a dentist’s office would have cost. But this $15 million is just what was paid to hospitals — not necessarily what hospitals actually charged for these emergency services. AEG estimated this amount to be a whopping $58 million, or about $8,300 per emergency room visit. What can be done to avoid these types of unnecessary health care costs? Clearly, more people in Michigan need access to dental care. One way of making it easier for people to get that care is to allow for more dental service providers to operate in the state. Currently, Michigan only allows licensed dentists and dental hygienists to perform the treatments that would have prevented many of these emergency room visits. On a per capita basis, the number of dentists in Michigan is close to the national average. But they are not equally distributed throughout the state, leaving too many people without an easily accessible dental provider. Moreover, Michigan’s dentists are aging quickly and a sizable amount of them are likely to retire soon. Other states face similar issues and are creating midlevel dental providers, sometimes called dental therapists. A dental therapist, supervised by a dentist, could provide basic preventive treatment and other routine care, which would likely reduce the number of emergency room visits for dental conditions. 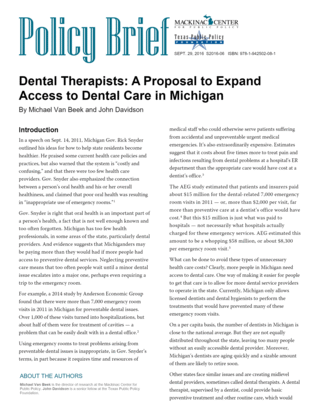 Michigan should consider this approach as it will: 1) help deal with the current identified dental care shortage areas, 2) put downward pressure on the price of dental services, making it more affordable for more people, and 3) respond to Michigan’s future demand for dentists.